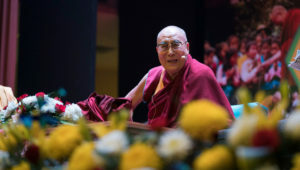 New Delhi, India – After days of hazy mornings, today was clearer and brighter as His Holiness the Dalai Lama drove to the NCUI Auditorium in the Siri Fort area of South Delhi. He was met on arrival by his host, founder and Chairman of the Smile Foundation, Santanu Mishra. The Smile Foundation is an NGO whose aim is to empower underprivileged children, youth and women through relevant education, innovative healthcare and market-focussed livelihood programmes. It is directly benefiting 400,000 underprivileged children and families every year through 200 projects affecting 950 remote villages and slums across 25 states of India. Once in the lobby, His Holiness was welcomed by a small group of shyly smiling eight and nine year old children. From there he was escorted onto the stage where well-known news anchor Rini Khanna introduced him to an audience of 620. She described him as a charismatic person who embodies a spirit of kindness and compassion that has a transformative effect on those he meets. She noted that he refers to himself as a simple Buddhist monk, who is most often seen smiling and laughing, and who tells us that the purpose of life is to be happy. In a short introduction to Smile Foundation, Santanu Mishra thanked His Holiness and everyone in the audience for their presence. He expressed the hope that His Holiness’s words would be a life-long inspiration to the children listening to him. He explained that the Smile Foundation’s goal is the uplift and empowerment of underprivileged children, youth and women. His Holiness greeted the members of the audience, young and old, as brothers and sisters, telling them how happy and honoured he was to have been invited to speak by an organization that is giving real help in the field of education, especially to the underprivileged. “I want to share a couple of stories with you,” he told them. “Not long ago a family from Bombay came to see me seeking my blessings. I told them, I have nothing by way of blessings to give you, but it seems that you are quite well-off, so the real source of blessings is already with you. If you were to use some of your wealth to help children from the Bombay slums, by providing them with opportunities and facilities for education, that would attract real blessings to you. “On another occasion, some students attending a prestigious institution asked what they could do to help. Again I suggested they seek out the poorer children where they live and contribute directly to their education. I encouraged them to try to help those especially who had no other help. “Since Independence, education has expanded and improved in this country, and yet there remains a huge gap between rich and poor. And the poor get left behind. It is essential that they are able to build self-confidence. “Once in South Africa I visited a family in Soweto. I congratulated them on South Africa’s new-found democracy and urged them to look forward to the day when black and white Africans would be equal. One of them shook his head and told me it wouldn’t happen because black brains are inferior to white ones. I was shocked and remonstrated with him that no brain expert would agree that there was any such difference between the brains of black and white people or their potential. Eventually, after much persuasion, he conceded with a sigh. His Holiness reiterated his view that to address the gap between rich and poor, it’s important for those with wealth to provide education facilities. But it is also important that the poor work hard and exert themselves to bolster their self-confidence. He stressed that here in India this particularly applies to those who belong to the so-called ‘lower castes’. He reminded his listeners that the 7 billion human beings alive today are physically, mentally and emotionally the same—they are equal in being human. “The Smile Foundation is already making effective progress in providing education facilities for the underprivileged. I really appreciate your work. So I have decided to contribute to supporting it over the next five years. When I see reports of children neglected and starving in different parts of the world I feel like crying because there seems so little I can do to help. Supporting your foundation as you help children is something I can do. “Also, I feel it’s important to do something here in India because India is important to me. Not only has it been my physical home for the last nearly 59 years, but my mind is filled with Nalanda thought. I am proud to be a student of the Nalanda Tradition that is distinguished by its reliance on reason and logic. This tradition was introduced to Tibet in the 8th century by the erudite Nalanda scholar, Shantarakshita and we have kept it alive through extensive and rigorous study. His Holiness remarked that generally modern education is focussed on material goals without looking within. However, he is of the opinion that India is the one place where it may be possible to augment this approach to education by combining it with ancient Indian understanding of the workings of the mind and emotions to achieve peace of mind. In answering students’ questions His Holiness touched on the role of anger and attachment in our lives and how extreme emotions can become harmful. Asked if we can envisage a time when we are all equal, he answered that we will never be 100% the same because we have different DNA and different dispositions. But common sense tells us that we share common experience. We have all been born from a mother and basked in her care and affection, which plants a common seed of love and affection within us. Invited to name his role model or someone from whom he takes inspiration His Holiness mentioned the Buddha Shakyamuni and the Indian master Nagarjuna who stressed the need to overcome the gap between appearance and reality, which becomes the ground for addressing our disturbing emotions. After the formal words of thanks, His Holiness posed for photographs with teachers and staff of the Smile Foundation and then with groups of children from seven Delhi schools in the audience. 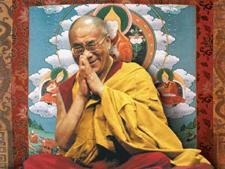 Tomorrow, His Holiness is to travel to Bhubaneswar, Odisha.